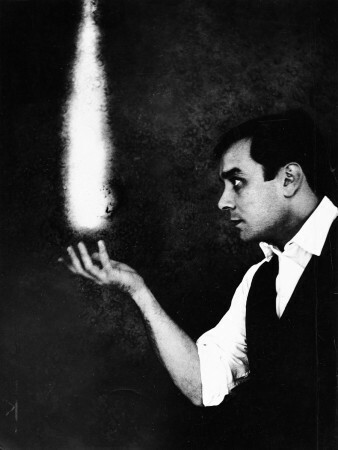 To understand this photo of Yves Klein—holding a levitating flame in, yes, pre-Photoshop days—is to understand him as both a playful provocateur and also a critical creator. Many know Klein as Le Monochrome, the man who patented a unique painting formula that resulted in his brilliant, and famous, IKB canvases. Yet, perhaps not as many know of his radical criticality: Yves Klein critically rejected preconceived notions of painting in ways that productively afforded new ideas for the medium. Through writing (which he did prolifically) and creating (in ways that expanded the painting medium), his creations antagonized what painting could be. But, rather than annihilating the practice, Klein used his tools to re-imagine the very nature of his discipline, and it is his form of criticality that I am most interested in borrowing to draw potential parallels to a critical practice in graphic design discipline. Through Klein, I sought to borrow his archetype of antagonizing a creative discipline, in addition to some of his concepts. 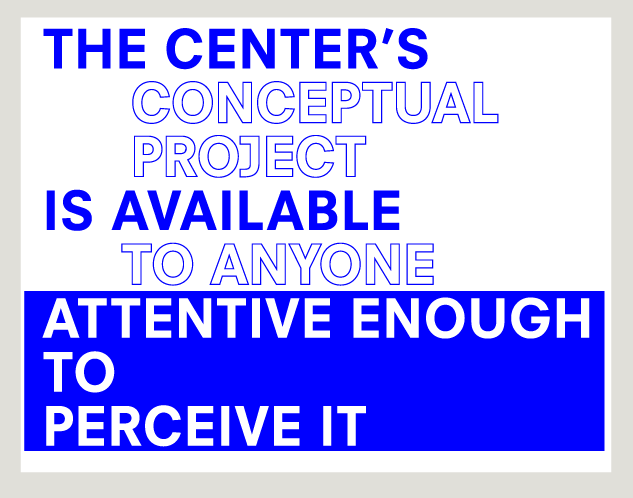 The Center for Sensibility, my thesis project, antagonized the practice of design and sought ways to productively work against prescribed notions of design practice. Inspired by Klein, I sought ways to immaterialize design, and to show that the doing nothing aspects of design—like research, writing, and organizing content—are viable parts of practice. 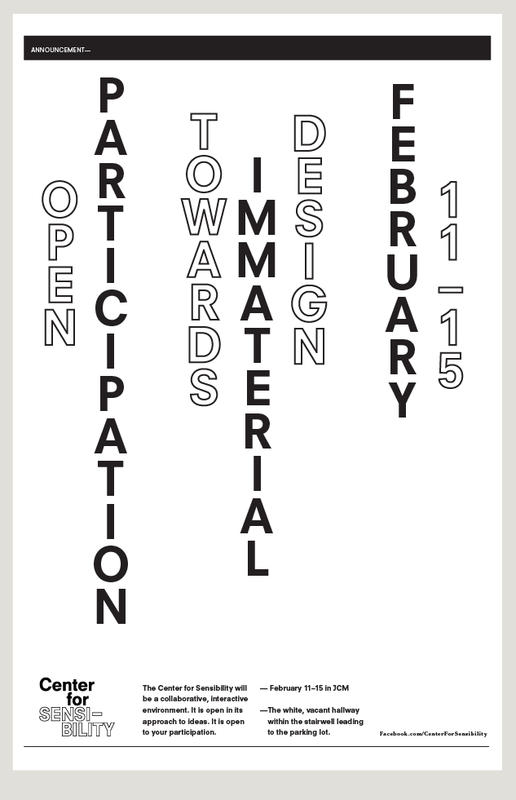 I explored immateriality in two ways: 1) as a research-based process that enables me to bring new ideas to my practice and share them with others; 2) as immaterial design, forgoing a designed artifact for a designed experience, that permits a community to participate in my project. 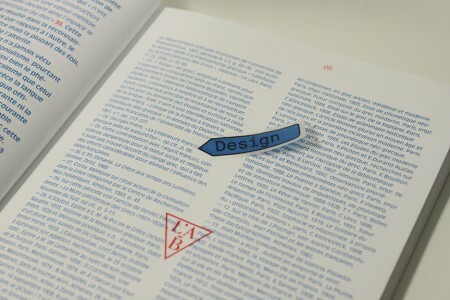 Inspired by relational design, I sought to eliminate disciplinary boundaries of my university (a school of art and design) to permit a cross-disciplinary dialog about graphic design. These ideas, I thought, could build towards interesting applications for critical practice. Before I jump into my project, though, I’d like to share the ideas and resources which laid the framework for my exploration. Critical practice is not the same as expressing opinion or criticizing a finished design; it is not about taking to the comments section of a blog to tear down a designer or a design. 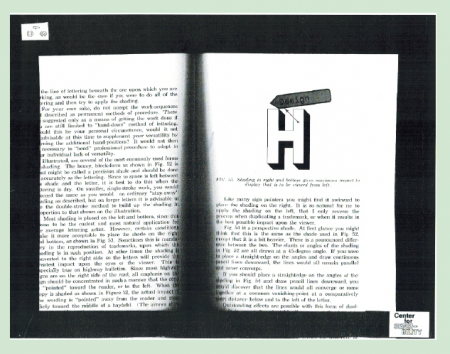 Although that form of criticality is productive in its own right, critical practice is more about expressing disciplinary issues or concerns in ways that help define and strengthen the graphic design discipline. 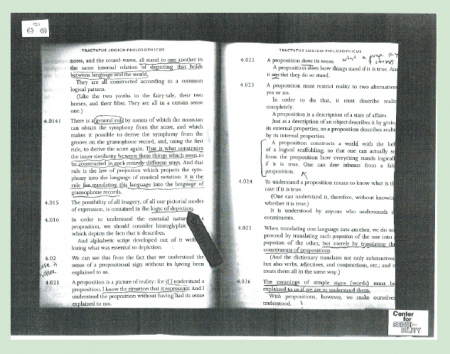 The motivation for critical practice is within problem finding: locating issues or concerns within a discipline and exposing them to discussion. 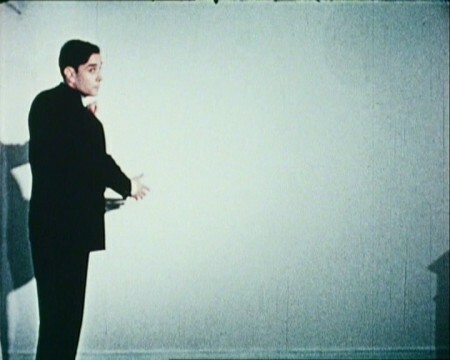 Or, in the case of Yves Klein, creating in a way that exposes and investigates the concern. For graphic design, motivations for critical practice are plentiful and many. These motivations re-imagine the way graphic design works; they are productively contrary to preconceived notions of practice. 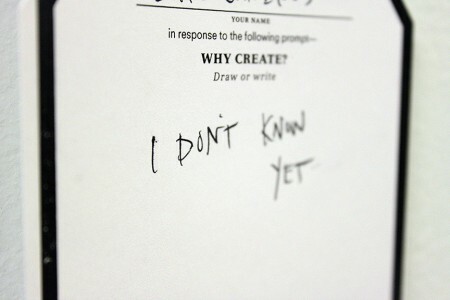 Concerns include designing self-initiated projects or self-propelled research questions rather than client-assigned projects (read the essay Research and Destroy: Graphic Design as Investigation by Metahaven’s Daniel Van der Velden), or designing to inquire into distribution (like The Book Trust), or, in the case of Forms of Inquiry, exposing design to other creative domains (like architecture or painting) to influence ways of designing. These practices not only antagonize practices of design, but they are fruitful applications of contrary forms of thinking about the discipline. Critical discourse leading to thoughtful application. Andrew Blauvelt exposes some ideas about disciplinary concerns in his 2013 D-Crit lecture “Graphic Design: Discipline, Medium, Practice, Tool, or Other?” (a lecture that is a timely reassessment of his 2003 essay “Towards Critical Autonomy, or Can Graphic Design Save Itself?”). 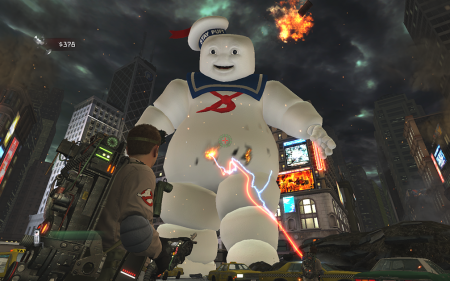 The design discipline of the late 2000s—an amorphous blob akin to the Ghostbuster’s Marshmallow man—ballooned to a vast array of practices: motion graphics, font design, info graphics, web design, systems design..the list goes on. This fur ball of practice weakened the idea of a coherent discipline and, moreover, no forms of practice gave the discipline running room for critical discourse. Waging a war on too many fronts, design had no strict focus, and no foundation for critical discourse—no methods of designing that better defined or strengthened the discipline. In order to “save itself” and move towards critical discourse, Mr. Blauvelt states that design must use its own forms and methods of practice in self-reflexive ways, ways that allow design to generate meaning from its own resources. Design that self-initiates its own projects, self-propels its own research and content, and self-reflects inward (exploring design through designing, or writing about design). These self-reflexive practices build critical discourse, help strengthen the discipline: critical practice forms a core, foundational center that reflects upon the knowledge, skills, applications, and needs of the discipline. By forming this core center, we can make or write according to these principles. Again, critical discourse leading to thoughtful application. Self-reflexivity is not a kind of useless play or aimless wandering. And, this type of freedom is not equivalent to the type of freedom the art world seeks. Instead, it is about showing design as a uniquely self-sufficient and antonymous discipline, where designer’s self-reflective practices can be used as a way to define or strengthen our discipline: where designers themselves apply critical discourse to active practice. 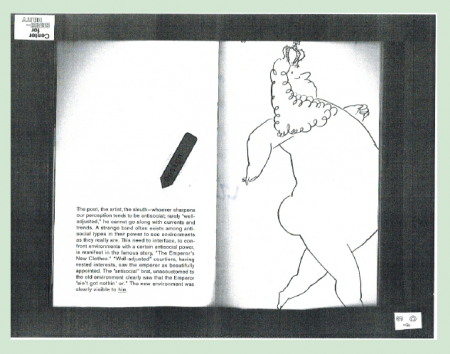 My favorite phrasing of this idea, as seen in the header text, comes from Ramia Mazé in her lecture delivered at the Forms of Inquiry exhibition (you can read the transcript in the book for the exhibition, titled The Reader). As designers, we have the opportunity to use the visual forms and vehicles of communication that we typically use for everyday practice in way that afford the running room for critical practice. 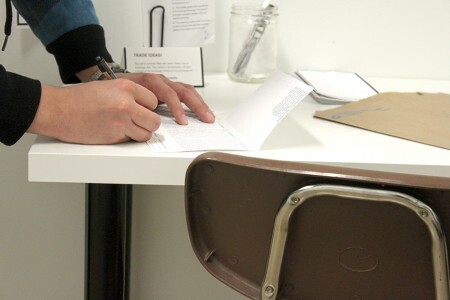 We have, through voice and agency, the opportunity to critique design through design. 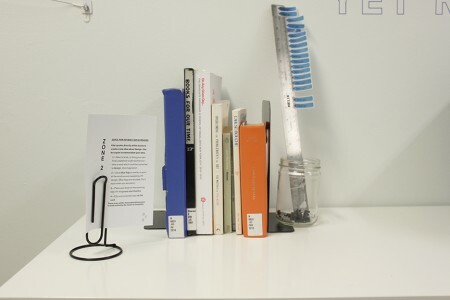 On top of application, designers are writing about critical practice too: like Francisco Laranjo’s thesis website Modes of Criticism or That New Design Smell by Michèle Champagne. 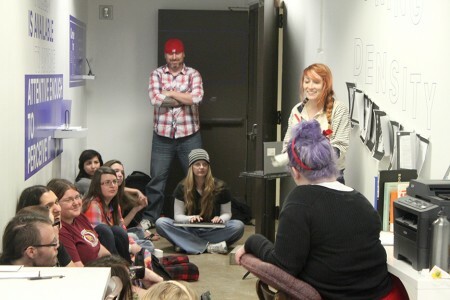 The Blunt Conference, which happened in April of this year, promoted critical practice through writing and engaging in disciplinary questions. Through self-reflexivity, we expand the foundation of our discipline beyond the status quo of marketing tool or service. With critical practice, we set forth the unique identity and specific contributions of graphic design as an autonomous discipline—graphic design as having particular skill sets and knowledge. Just as architecture, film, or literature have their own foundational discourse that guides and informs methods of practice, so, too, can design. In this way, design can be more than a tool or a style: design is about the power of content and ideas, visual forms and aesthetic, plus distribution and communication. I thought Yves Klein offered ways to work contrary to forms of practice. By borrowing from the painting domain, I thought I might reveal a few fruitful, latent potentials for design practice. Klein’s ideas of immateriality lend themselves to exploration as a design practice. Philippe Vergne, curator at the Walker, states in his essay (beautifully titled, Earth, Wind, and Fire or to Overcome the Paradox of Yves Klein the Molecular Child Who Wrote to Fidel Castro on His way to Disneyland) that “Until we truly understand that the world of ideas can exist beyond material manifestations and traces, we, and art and social institutions, will remain incomplete.” This idea frames my point of exploration—that design can exist beyond objects, that research and ideas can lead to an open exploration of design practice. And, finally, that as an immaterial practice, design can connect and inspire a community. Immaterial design could be explored in two ways: first, as relational design that opens up the design process to others to contribute content (Blauvelt also wrote about relation design; it is also extensively covered in a chapter in The Reader). Relational design creates a system that permits relevant collaboration and production; it subverts design by allowing open-ended content that enables the ideas from many people, versus the sole authorship of the designer. Second, as the design of spaces and experiences—in other words, my system for relational design—that permit learning. 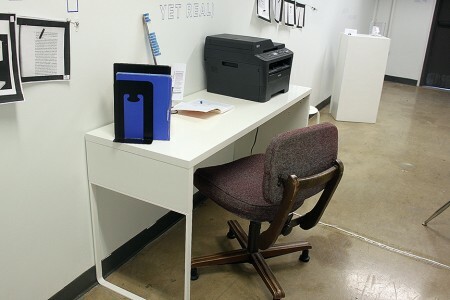 My research into Yves Klein manifested as a designed experience that, unlike finished designed artifacts, permits participants to be thoughtful and draw their own conclusions. 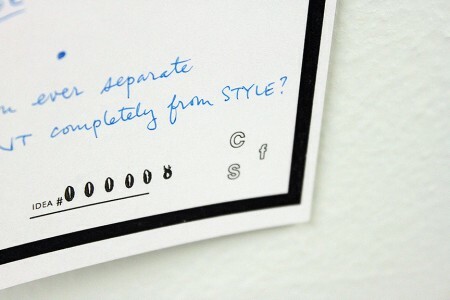 I sought a dialogue about design; not a monologue. 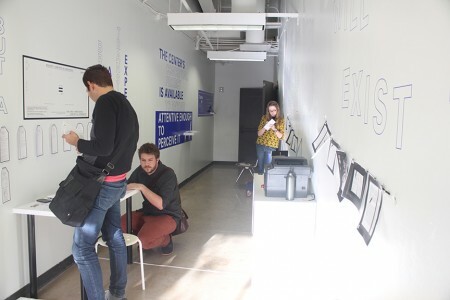 I designed the Center for Sensibility, modeled after Klein’s own proposal for a center for sensibility, which was an interactive installation that, for one week, transformed a vacant hallway of my school into a collaborative, open-format workspace for collective thinking and doing. I used design to explore design, and as a means to connect to my community of other designers and artists. 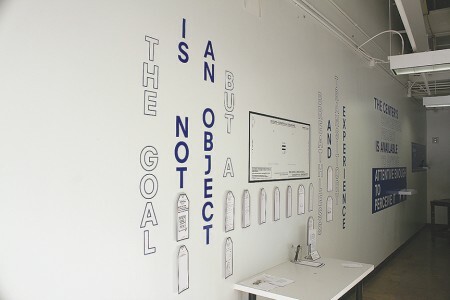 Encompassing the hallway walls, a large-scale typographic installation featured Yves Klein quotes and housed three interactive activities. 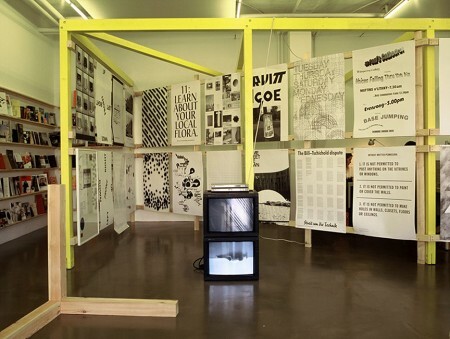 These invited participant contributions which manifested as content within the installation. Design itself is thought. The design methodologies bridge form-making to my research. I focused on the elements of graphic design—typography and color—that best lend to designing an experience; typography could act as an autonomous design element. Neuzeit S, a neutral sans serif, is German for “new time,” an appropriate meaning for this project that sought new ways to use design. It has a warm neutrality, has a default-quality like Helvetica, but has a personality of its own—it allowed the content to preface the typeface. I arranged the type in ways that made the space around it apparent. 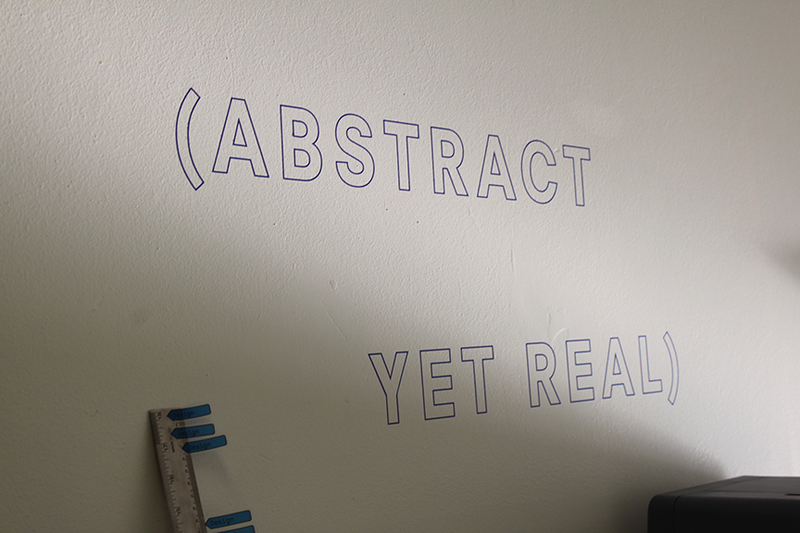 Positive and negative spaces were activated, enveloping the hallway with typography. 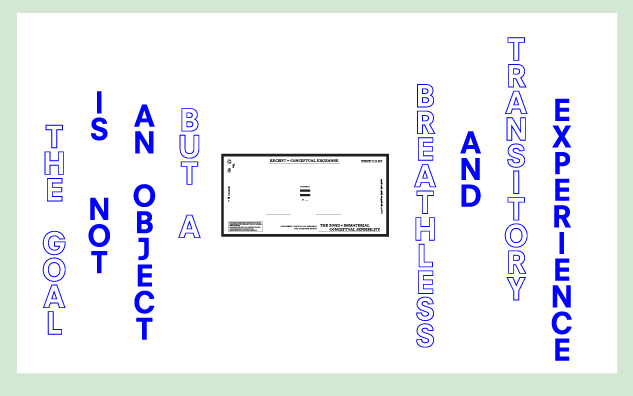 In Zone 3, I vertically stacked the type, to convey the idea of levitating type—mimicking Yves levitating in space. With the idea of using space as a design element, the color palette fell naturally to using pure blue, black, and white. 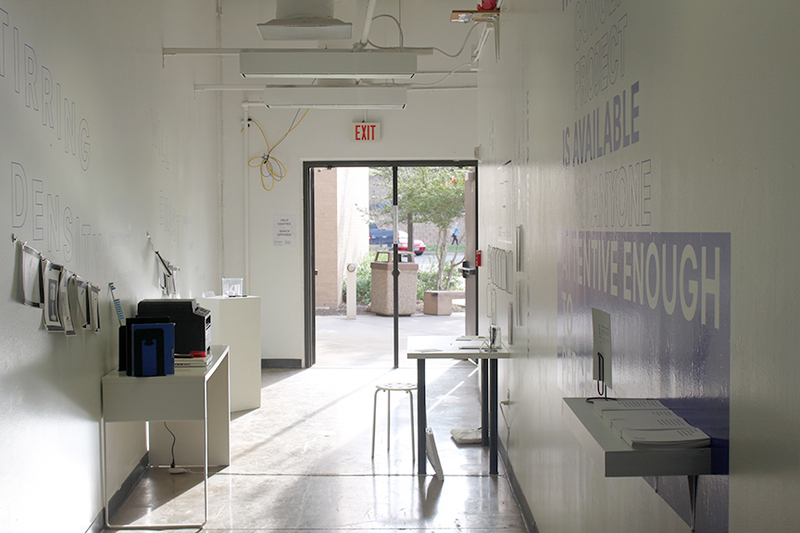 The typographic installation was cut from process blue vinyl, and all printed matter was printed using a black and white laser printer. 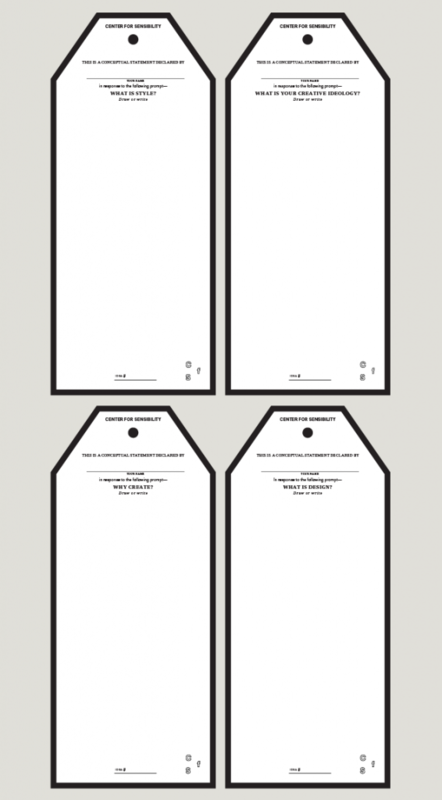 Collateral included a vinyl hours sign, a brochure (with perforated comments strip), instructions, and poster. I created a collaborative, open-format work zone by establishing three distinct areas within the 30′ hallway for content production. Each zone was nestled within one of the quotations on the wall. 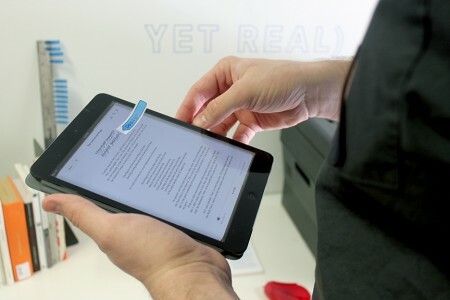 These invited participant contributions—via scanning books and displaying the print on a wall, or via open-ended responses to questions— which manifested as content within the installation. As the week went on, more content and more ideas about design enriched and sustained the investigation. 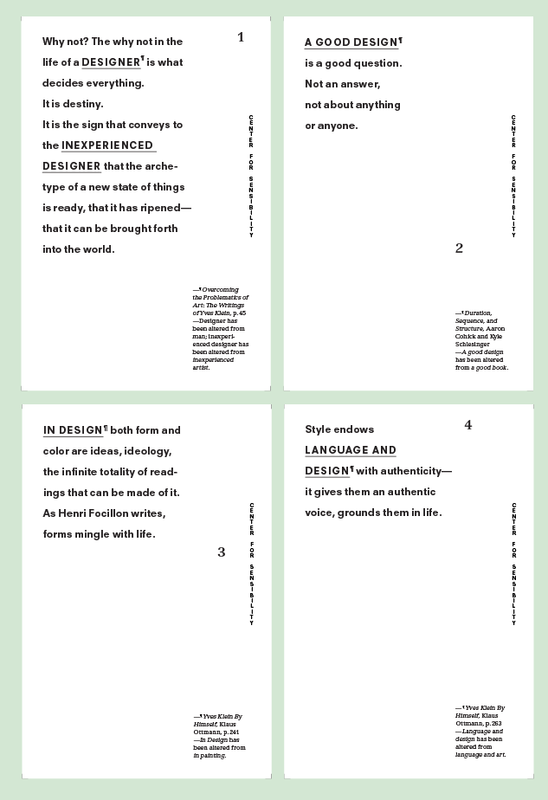 Participants selected postcards that featured quotes about design (zone 1); they redefined design in their own terms using supplied books and scanning their definitions (zone 2); and, in a conceptual exchange inspired by Klein’s Zone of Immaterial Pictorial Sensibility, they traded responses to open-ended questions (zone 3). Zone 1 production area—participants pulled one card from only one stack, each stack containing 50 cards each (laser printed on 100# cover stock). 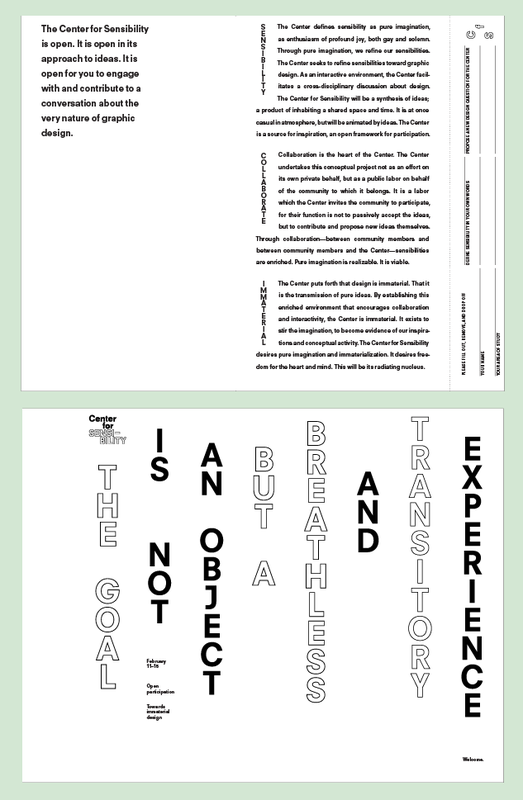 Zone 2 vinyl typography mock-up—a quote I pulled and altered from the same Vergne essay. 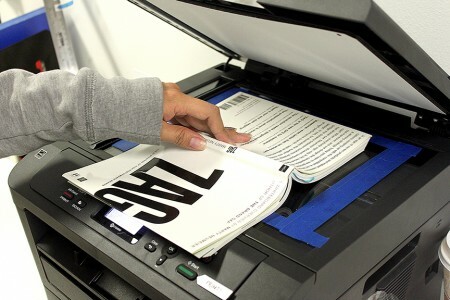 Zone 2 production area—after scanning a book, the printouts were displayed on the wall for others to read. Zone 3 with an exchange taking place—the participant created the card on the left in order to steal the card on the right. This zone was a conceptual exchange that was about trading ideas. 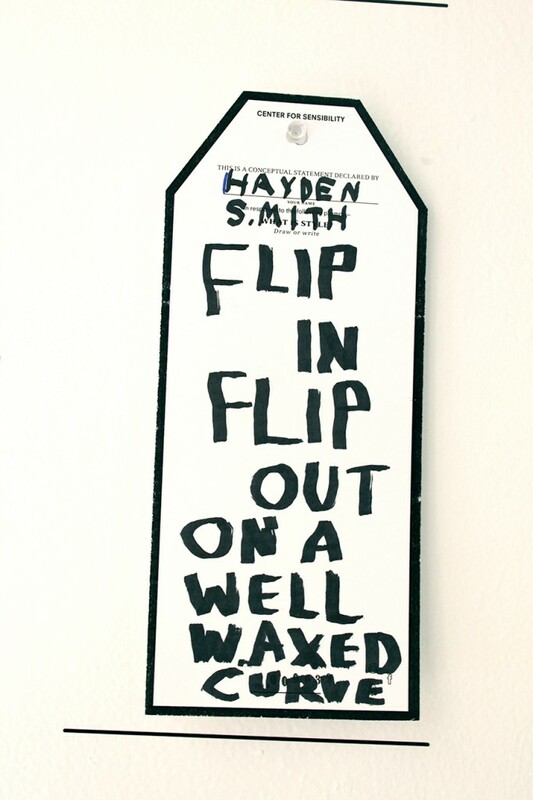 MFA candidate at CalArts and my friend/collaborator called in from Valencia and dictated to me his idea. 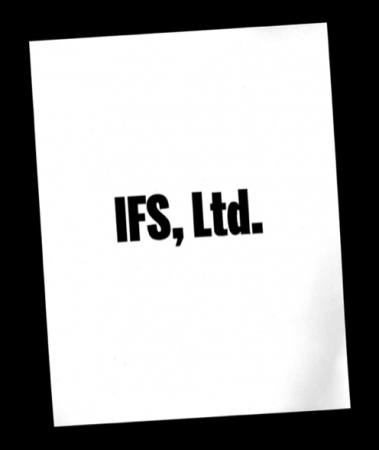 The video of the process is available to see on the CFS Facebook page. 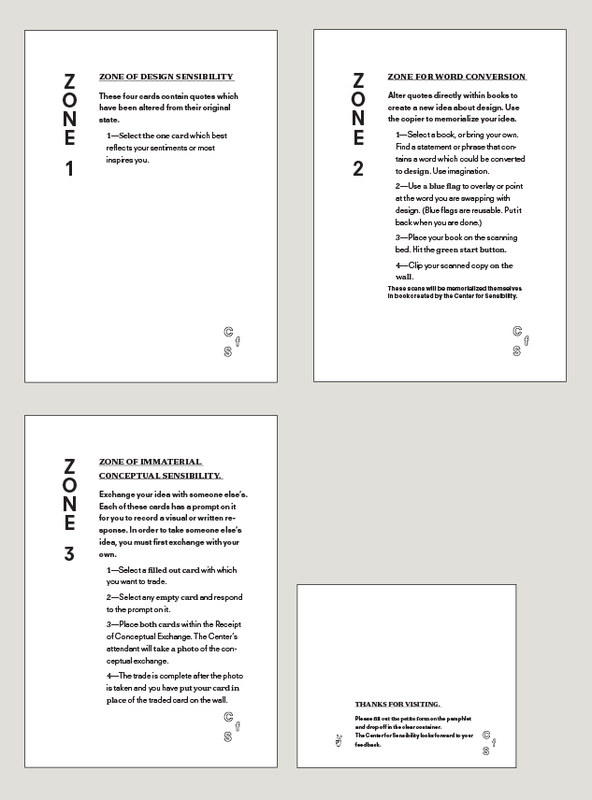 Zone 3 cards—each card had one question that inquired into definitions and ideas about design. 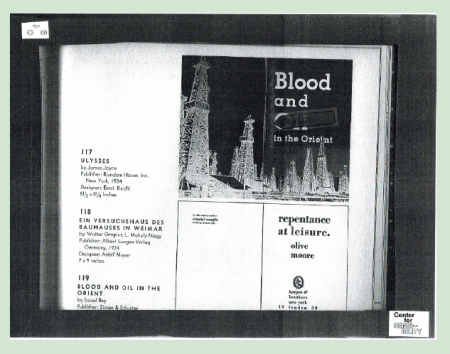 In all, I received over 200 unique contributions in the forms of book scans (zone 2) and idea cards (zone 3, available to see on Facebook). 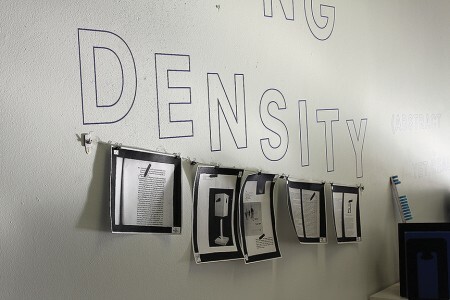 In zone 3 (idea exchange), contributions reacted to the quotes on the wall; others responded to other contributions within the space, creating a community dialog. Highlights of this week long installation involved entire classes visiting the space. I would walk the students through my ideas and answer their questions, or provoke them with my own questions. BUT IN A BREATHLESS AND TRANSITORY EXPERIENCE? Revealing potential methods of practice, my project showcased the design discipline’s ability to examine its boundaries, to productively inquire and imagine outside its own context, and to share ideas and permit participation. It revealed design’s wonderful malleability to function beyond designed artifacts and to embrace immaterial methods of designing. 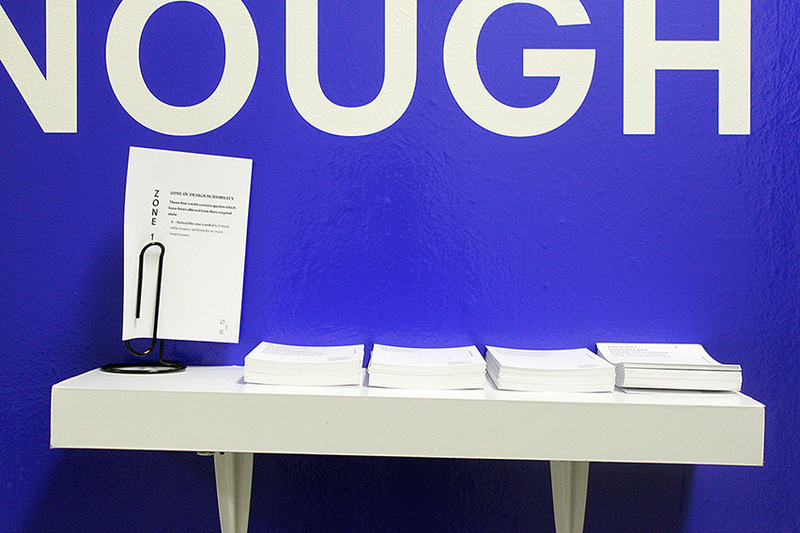 Further, the installation provoked participant’s own thoughtfulness and critical thinking. 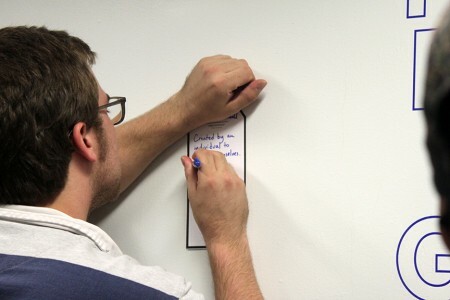 What better byproduct for design to encourage? Critical practice engages the hows and whys of practice, leading to engaging applications that question the nature of design processes and application. It is about designers posing intellectual ideas that produce thoughtful, engaging outcomes—about showing design beyond a service tool and instead as a practice capable of engaging in ideological questions that confirm and reinforce design as profession. But, we’re not quite there yet, and it is up to more practitioners to design or write about design in self-critical ways. It is important to ask ‘why?’ and keep personal practices, and the discipline at large, under analysis. I encourage comments regarding ideas about critical practice or otherwise.